Having this children's entertainer dressed up as a costume character for kids birthday parties is a great idea for a children's birthday party. So that the perfect kids costume character can be found for your child please get in contact and one could be at you party on stilts. The stilt walking children's entertainer pictured here is located in Scarborough, North Yorkshire but is a full time professional entertainer and serves the whole British Isles. Feel free to call this children's entertainer on stilts and you are sure to be most satisfied when this kid's entertainer comes as a stilt walking costume character for a memorable birthday party visit for your birthday child. This character stilt walker trusts that you will look around for service, quality and experience in other entertainers and entertainment businesses after which your choose will come back here to supply your birthday party entertainment. Uncle Brian has numerous entertainment packages on hand that will adapt to your child's next birthday party. UBEEM's birthday party action plans include music, party dancing, stilt-walking, balloon twisting, face painting, temporary tattoos, musical games, puppets, comedy car, circus skills teach-in, craftworkshop, singing happy birthday, posing for photographs and much more. Uncle Brian's Entertainment and Event Management has costume character entertainment parties catering for girls and boys. 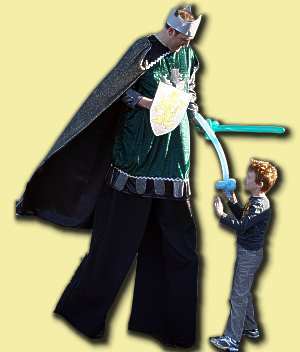 In addition Uncle Brian's has stilt walking costume characters for any function or affair. In addition to dressing up on stilts as a costume character Uncle Brian organises party shows featuring clowns, pirates, safari guide and much more. The children's entertainer, Uncle Brian will knuckle down to turn your children's birthday party entertainment into a memorable happy event. This is the reason behind allowing a vast range of kids birthday party character entertainment parties in the UK. The children's entertainer in your choice of costume character will put on a fab children's show wearing the Kids Costume Character you pick. The Costume Character Party Deal can feature craft workshop, puppets, story telling, face painting, circus skills teach-in, balloon animals, music, games & dancing for the children. Please get in touch with the Children's Entertainer in North Yorkshire and let it be known what you desire and queries are, the Children's Entertainer will be more than happy to help. You can also contact by email. We would also like to state that we do not offer to be a characters from TV. The Children's Entertainer only wears professional theatrical costumes. It is not the children's entertainer's intention to violate any copyright laws. The characters that the children's entertainer offers to wear are NOT name brand copyrighted characters, and he makes no attempt to market them as such. The characters that the Children's Entertainer has are of his own creation. Any resemblance to nationally known copyrighted characters is strictly incidental and unintentional. If you have any questions regarding this issue, he encourages you to contact him. Should you have the need for a licensed, copyrighted character at your event, the children's entertainer encourages you to contact his entertainment agency for the company/copyright holders for your specific targeted character. The children's entertainer's are as generic as he could make them. In addition, he will only accept personal bookings from individuals who are aware that he personally DOES NOT represent any licensed character. So please give the children's entertainer a call so that he can make your event fun, exciting and memorable for years to come. The Children's Entertainer strives to offer the best parties, and service and all at the lowest prices possible.